The world experienced its third major global coral bleaching event from 2014 to 2016. Warm ocean temperatures driven by El Niño caused corals to bleach and die, particularly on shallow water reefs. This bleaching event was the worst experienced, exceeding the 1998 event which killed over 90% of corals in the Maldives. While it is difficult to prepare for global climate events such as this, we are not powerless. We strive to help corals survive by reducing other forms of stress (from sediment) or mortality (from crown of thorns starfish). Furthermore, we have implemented coral nurseries to help rapid reef restoration efforts post-bleaching. Four nurseries were constructed in the Maldives, one each on Vabbinfaru and Ihuru, and two on Velavaru. 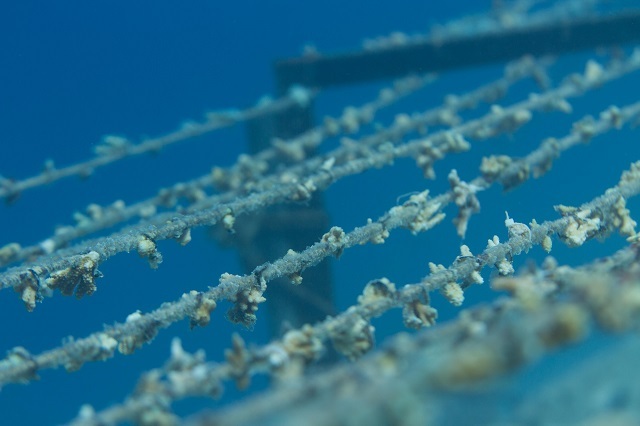 Up to 1000 coral fragments are grown on each nursery attached to ropes at a depth sufficient to avoid the warm surface waters. Once reaching a suitable size, these corals are transplanted directly to our house reef, to assist natural recovery and maintain a healthy house reef for everyone to enjoy.